OpenSignal’s newest report on U.S. Wi-Fi speeds contains a particularly interesting nugget of information: the network measurement firm found that the Wi-Fi speeds we get from public hotspots, in places like coffee shops, hotels and retail stores, are consistently faster than the speeds we see over 4G networks. 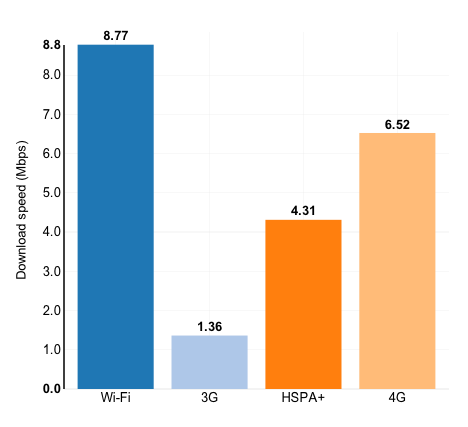 While the typical smartphone user connects to a free Wi-Fi hotspot at 8.77 Mbps, he or she sees only 6.52 Mbps on an LTE link and just 4.31 Mbps on an HSPA+ link, according to OpenSignal’s data, which it collects from millions of tests taken by its crowdsourced network measurement app. That’s probably not a big shock to many of you. More bandwidth is often one of the main reasons we switch from LTE to Wi-Fi when it’s available, but the U.S. is actually an exception among countries with developed 4G infrastructures. In places like Sweden, Australia, Korea, Japan and the U.K., LTE connections routinely outpace public Wi-Fi networks. Carriers like the U.K.’s Everything Everywhere are reporting that Wi-Fi usage on their customers’ devices is actually on the decline. Why the discrepancy? It has a lot to do with the way the U.S. deployed 4G. It was among the first countries in the world to deploy large-scale LTE networks, but those networks were built over fairly small chunks of spectrum. While U.S. carriers were using 5 MHz or 10 MHz of spectrum for their download channels, European carriers started with 20 MHz. In Australia and East Asia, several carriers have already started using LTE-Advanced carrier aggregation techniques to pile even more spectrum onto their networks. But there’s another reason as well. The U.S. has a very high LTE penetration. Nearly half of all global LTE connections at the end of 2013 were on U.S. networks, according to the GSMA. Basically, that means our networks are getting crowded with more people competing for the same capacity. Combine that demand with the smaller size of our pipes, and you can see why the U.S. is almost dead last in OpenSignal’s global LTE speed rankings. But there’s a lot of new network construction going on the U.S. this year. Verizon(s vz) recently built a new LTE network at a new frequency band in major cities. In many areas, that new network boasts twice the speed of its old one. AT&T(s t) is doing the same, and it’s also using new carrier aggregation to bond those networks together. Every six months or so, T-Mobile is doubling the capacity of its current network. That should mean that speeds will kick up a few notches, as more devices that can tap these networks come onto the market. At some point, we’ll find our 4G networks delivering a better experience than a Starbucks hotspot. That said, Wi-Fi speeds are also improving. 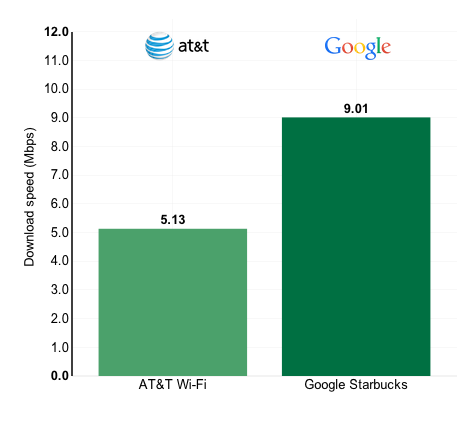 OpenSignal found that when Starbucks moved from AT&T to Google Wi-Fi, average speeds went up by 4 Mbps. And we’re still just on the cusp of seeing new 802.11ac technologies deployed. We could wind up having a race between wireless technologies. The real race is volume and price, speed is less relevant given how limited LTE is. The real life benefit of speed is minimal when you can’t use it for large files/significant traffic and you can’t when it comes to LTE. Benchmarks like to look at many page loads and show a significant difference but when it comes to loading a single page,there shouldn’t be much of a practical difference and ping times might be more important. LTE is good for marketing but in practice it’s a con.You get speed you can’t use and that doesn’t really matter in practice. At 10$ per GB or more, people are not about to actually start using LTE for large files where the speed actually matters. For everything else speed is of little relevance as long as it is enough to allow you to stream video and you can’t even do that over LTE ,it’s just way too costly.. I do wonder now if anyone looked at ping times LTE vs wifi and i also forgot to mention power use,, that matters too but not sure how the new 20nm LTE chips from Qualcomm would do against the current wifi ac chips.It used to be that LTE was quite a lot more power hungry but that should be changing.